Well the niggles came back again just in time for a last minute panic a few hours before Fred was about to get on the eurostar for our ski trip, with me due to follow on the next morning. They had a good look and couldn’t find anything at all out of the ordinary thankfully, apparently it’s just one of those things and may happen again, but they were very nice and said I should just go back if it does so they can set my mind at rest. I have to say all the medical staff I’ve dealt with so far have been really good, well the chap who did the blood tests was a little scary, but good at taking blood! Anyway this one is a bit clearer, head on the right, and you can see one of the legs sticking out top left. Once again Smidget was very active – two Sonograohers have now said “oh, you’re not going to get much sleep once you can feel this one” – So there’s something to look forward to! 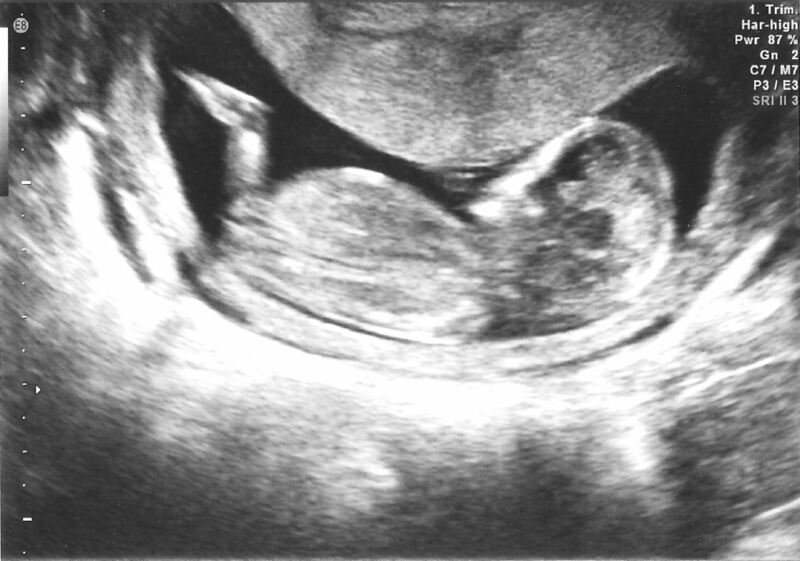 The next routine scan is at 20 weeks, and much as it’s lovely to see Smidget I hope I won’t be seeing it again until then! Next: Next post: Does My Bump Look Big In This?